Flying a CCPM heli is hard. The reward is high (you really feel a sense of accomplishment when you succeed) but nothing changes the fact that it is very dificult. I highly recommend this online flight school for an excellent set of instructions on learning to fly. Unfortunately, for those of us that enjoy flying 3D helicopters, the drone market is ruining things in may ways. First, and foremost, is the proliferation of inexperienced pilots with no sense of responsibility. These drones are so easy to fly that many people do. Unfortunately, a lot of these new pilots are rather irresponsible - flying over others property, crashing into buildings, etc. This makes the general public suspicious of all RC helicopters and means responsible pilots have to be extra careful to respect the rights of everyone. The other impact of the exploding drone market is the impact on manufacturers. My favorite company, Walkera, has decided to get out of the RC helicopter market in favor of drones. That wouldn't be that much of a problem except it's getting harder and harder to find replacement parts for my V200D03 (my favorite bird). Soon I'll be one crash away from having to retire this heli since I won't be able to fix it anymore. I live in a city with a population of ~100,000 (~70,000 after the students leave for the summer - hooray) and there are no stores in town that sell RC helicopters. A big city (population ~1,000,000) is 45 minutes away and it only has 1 RC store that sells helicopters (I really need to stop by and checkout that store sometime). Helipal and eHIROBO are both in China but I've had no difficulties dealing with them, they fill orders promptly and correctly and both have a lot of stock on hand. The downside to these two is that, unless you want to pay outrageous amounts for next day delivery, it can take a long time, upwards of 2 weeks, to get things. Wow Hobbies has the advantage that they are in the US and their cheapest shipping through USPS only takes a couple of days. Again, prompt and accurate order filling, this is my go to store (I hate it when they are out of stock on something). I should point out that, once you start buying parts, you will be dealing with multiple vendors. At some point in time your favorite vendor will be out of stock on a part you need so you'll have to find someone else who still has the item. Fortunately, the internet has a magic site that will solve this problem. The 450 size heli is the gold standard for outdoor flying. It's small enough that it's not that intimidating while being large enough to handle a certain amount of wind. I'm biased because I started with a 250 and you have a tendency to prefer the heli you start with (how many of you still remember the first car you drove and wish you still had it) but this is still a good choice for outdoor flying. This is a remarkably deceptive question. Normally you think of a crash as a major event when the heli craters into the ground and broken parts fly everywhere. Unfortunately, that is not a normal crash. Typically, a crash is whenever the main blades touch, be it ever so slightly, something solid. If you tilt the heli so that the main blade slightly scrapes the ground or if you drift sideways and just barely kiss the side of the house (or your leg - see below) you've just crashed and will now have to replace some broken parts. The problem is that the electric motor is attached to the plastic main gear with a metal gear the spins about 12 times faster than the main gear. Since the main blades are rigidly attached to the main gear, if you slow them down (by brushing them up against something solid) the main gear will slow down but the electric motor won't and its metal gear will wind up stripping out some of the plastic cogs from the main gear - time to visit the repair bench. There are other crashes (bouncing the tail against the ground, cratering into the ground and having broken parts fly everywhere, having the tail servo fail causing the heli to spiral into the ground) but stripping out the main gear will be your most common failure. I think the definitions of this very important feature are rather opaque. In a nutshell, the main feature of throttle hold is that it turns off the electric motor while leaving all other controls active. If this is optional on your transmitter go enable it - now. Since the collective pitch is typically tied to the throttle speed (increasing the collective pitch also increases the main blade speed) it can be difficult to check the collective servos in normal modes. I don't like to get my eyes close to the servos while the main blades are spinning - very bad idea. Turn on the throttle hold switch and the main blades stop while all the servos remain functional. In fact I try to start each flight by turning on throttle hold and then moving the collective and cyclic controls to make sure all the servos are operating properly. After that checkout it's time to turn off throttle hold and start flying. Note that throttle hold has other uses and attributes (like setting the collective pitch to a pre-defined value so it's easy to practice auto-rotation) but that's a more advanced feature that I'm not up to doing yet. Caution - this hobby is not without risk. These are models, not toys, and the main blade is rotating at insane speeds. This means that the force (remember that force is proportional to velocity squared) that the blades can apply is deceptively large. 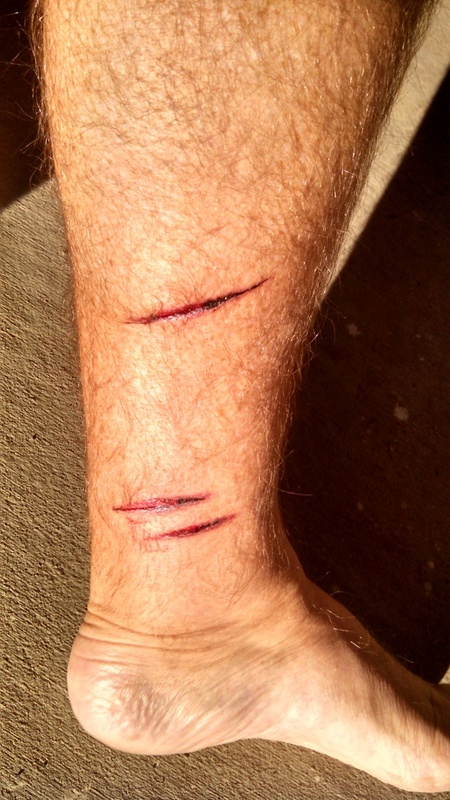 As a concrete example, this is the result of my CopterX 450 size heli attacking me shortly after takeoff. 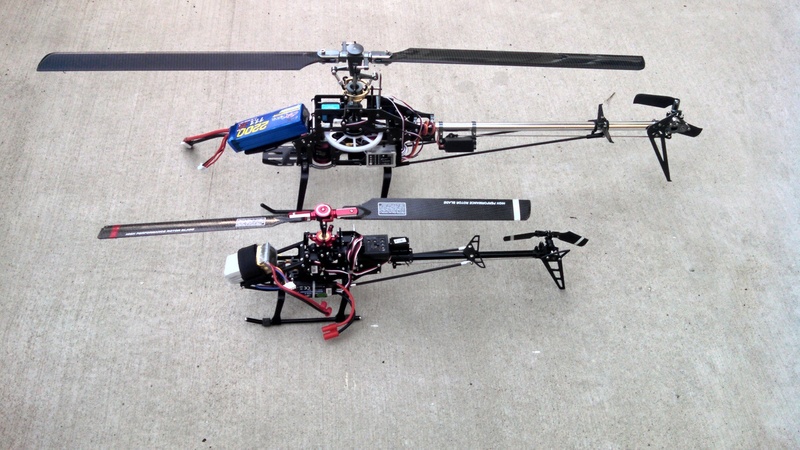 Should your build your first RC heli from a kit or should you get an RTF (Ready To Fly) unit? The argument for a kit is that, since you will crash and have to repair it, you will understand the repair process better if you built the heli from a kit. Plus, a kit is much cheaper so why spend your money on a unit that you'll break anyway? I think an RTF unit is a better first choice for the simple reason that you will not have either the knowledge or the skill to correctly setup the heli, even after completing the rather difficult task of assembling the kit. Correctly settng all of the mechanical linkages, electronic connections, and electronic control settings for a heli is hard (and rather poorly documented). Better to let an expert setup the heli and not have to decide if a problem is because you don't know how to fly yet or because the heli is not setup properly.